Muslims in Russia are celebrating the Feast of Sacrifice, an Islamic holiday dedicated to the Prophet Ibrahim (Abraham). More than 150,000 prayers are taking place across Moscow at traditional prayer halls, and unconventional spots like golf courses. ­The main celebration of Eid al-Adha – known as Kurban Bayram in Russia – began at Moscow’s Cathedral Mosque at 8:30am local time. 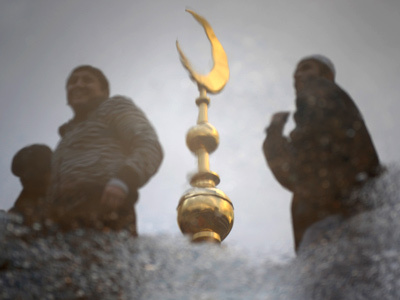 Despite the cold and rainy weather, worshipers gathered outside of mosques in the pre-dawn hours. Since there was limited space in the prayer halls, thousands poured out onto the streets as a mixture of rain and snow fell. Six sites near mosques and in designated locations were set to host Muslims in the Russian capital. Some 3,000 law enforcement officers were deployed to guard the sites. For security reasons, worshipers were not allowed to bring large bags or packs to the sites. Metal detectors were also set up to scan for potentially dangerous objects or weapons. The sheer volume of cars and people created kilometer-long traffic jams on streets neighboring the mosques. 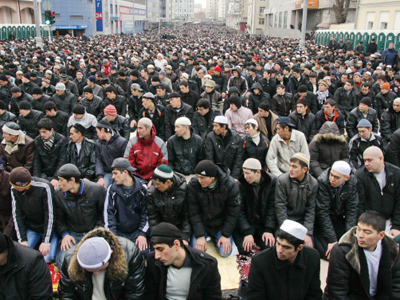 Thousands of Muscovites had a severe case of road rage, saying they could not get to work or drop children off at school on time because Muslims were marching in the streets to prayers, causing traffic jams. 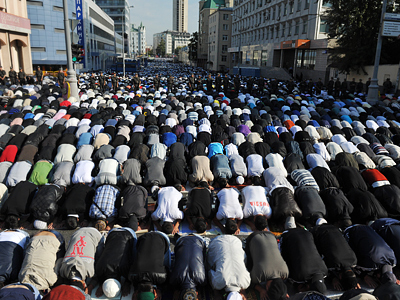 Moscow residents who live near the mosques also said the celebrations seem slightly noisier than in previous years. 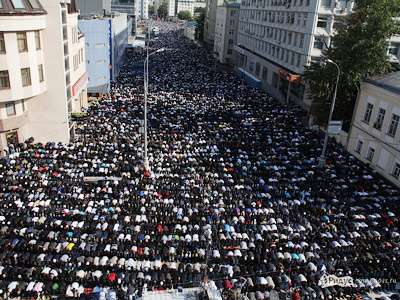 Public prayers had finished by noon, and the huge crowds dispersed and traffic in Moscow returned to normal levels. Police reported that the celebrations passed peacefully without any major incidents. Muslim worshipers have also been known to slaughter sacrificial animals for Eid in the streets of Moscow, a practice that has been banned in recent years. 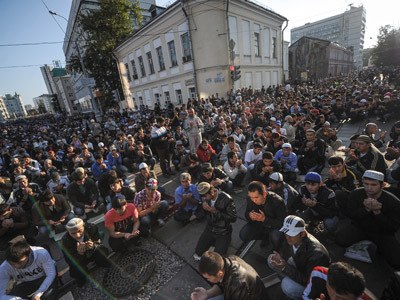 Leaders of the Muslim community of Moscow argue that these and other public disturbances are due to an insufficient number of mosques in the city. 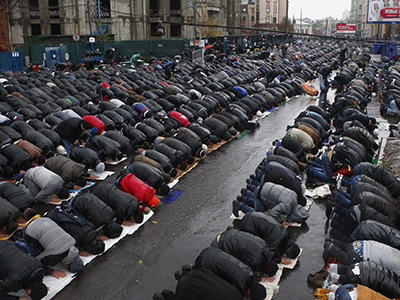 For a number of years, Islamic leaders have asked city authorities to allow for more mosques to be built – a proposition that even won support from former Moscow Mayor Yury Luzhkov. But the move was met with widespread protest, with Muscovites holding a number of demonstrations against the construction of new mosques. 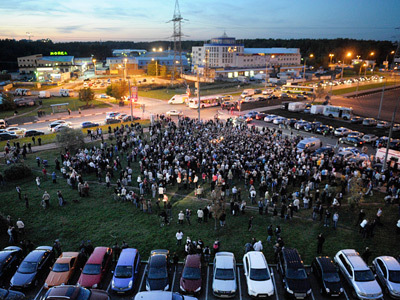 Mayor Sergey Sobyanin bowed to public pressure and put the proposal on hold. This year’s Eid al-Adha festival fell on October 26. The holiday is celebrated on the tenth day of the 12th month of the Islamic lunar calendar in all Muslim countries. The festival marks the end of the hajj for Muslims making their pilgrimage to Mecca, Saudi Arabia, which every Muslim is expected to undertake at least once in their life. The hajj is a multi-day ceremony that finishes on the day of Eid al-Adha.